Located in Norman's National Register historic district across the street from the University of Oklahoma campus, this handsome 1914 Craftsman house was built by Professor Fredrik Holmberg and his wife Signy. 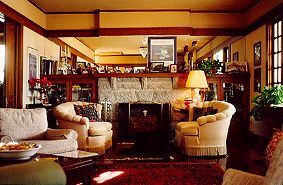 The current innkeeper bought the house in 1993 and now it serves to accommodate many of the university's visiting scholars and students' parents. Each of the four guest rooms are individually decorated with antiques and have private baths, with claw-foot tubs, and color cable televisions. A parlor with a fireplace, porches with rockers, and gardens are for guests' pleasures. A full breakfast is served in the formal dining room. Open: year round - Accommodations: 4 guest rooms with private baths - Meals: full breakfast included; restaurants nearby. Rates: $85-120 Payment: Visa, MC, AMEX, personal and travelers checks. Restrictions: smoking allowed on porch; no pets. Activities: Museums, nearby shopping, Oklahoma University athletic events, Cowboy Hall of Fame (40 min.). This and other Oklahoma Bed and Breakfast Inns can be found here in The Register.